Anton Shebetko is a Ukrainian artist and photographer based in Amsterdam who works closely with LGBT-related topics. His project Pleshka, about Kiev’s old cruising spots, was featured in the Festival of Young Ukrainian artists in Mystetskyi Arsenal in Kiev. 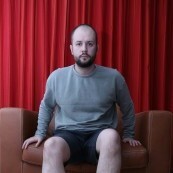 His latest project, Common People, is a series of altered portraits of and interviews with closeted Ukrainian gays. See more of his work here.